"Trope" sounds like a highly sophisticated literary device, doesn't it? Fear not. It's simply a label for words that say one thing but mean another. In essence, it's a synonym for "literary device," because it's all-encompassing. A trope can be a metaphor, a simile, an example of personification, verbal irony, and more. In more contemporary usage, it can be a synonym for cliché too. Let's walk through a few examples of tropes; seeing them in action will provide further clarification. Although tropes are types of literary devices, it's important to note its meaning in modern language. Tropes have somehow shifted from "a rhetorical device" to "a cliché." The trouble with rhetorical devices is that they can become overused and trite. How many times have we heard "if the shoe fits" or "he's lazy as a lump"? These are so boring and, in the end, cliché. Somewhere along the line, a trope started to refer to over-usage. So, in your next discussion of tropes, be careful you're not calling someone's work cliché, but rather commenting on their exquisite use of hyperbole, personification, or puns. Similes and metaphors are probably the most common types of literary devices, or tropes. Similes make comparisons between things using "like" or "as." For example, "Her smile shone bright as the sun." Metaphors do the same without using "like" or "as." For example, "Life will be full of clear skies from now on." Personification is another popular trope. That's where writers give human characteristics to inanimate objects. For example, "The happy little daffodil danced and swayed in the breeze." You can see how "trope" is simply a label for words and phrases that say one thing but mean another. They're words or phrases that aren't meant to be taken literally; instead, they provide depth and color to a piece of writing. Different types of tropes achieve different results. Hyperbole uses exaggeration to get its point across. This trope is best suited for fictional pieces of writing, as opposed to formal works of nonfiction. Hyperboles are extravagant overstatements that aren't meant to be taken literally. They bring a point home without having to blandly say what you literally mean. Irony comes into play when the outcome of a situation is the opposite of what was anticipated. Take the example of a romance novel. In the early stages of a novel, you might think the lead character is going to end up with the shop clerk around the corner, only to find out she marries the mayor. Something like that would be perceived as irony if the reader felt she was going to end up with the shop clerk. Macbeth, by William Shakespeare. In this tragedy, Macbeth appears to be loyal to Duncan. However, in the midst of their faux friendship, Macbeth is actually plotting his death. The Wizard of Oz, by L. Frank Baum. In this story, Dorothy and her comrades are in search of some great wizard to get them what they want, like a brain for the Scarecrow. In the end, the Wizard was a farce and they had what they needed all along. The Story of an Hour, by Kate Chopin. In this short story, the wife learns her husband is dead and rejoices for her newfound freedom. It turns out the husband never died and, when he returns, the wife dies of shock. A metaphor compares two things that wouldn't normally be paired together. These tropes are capable of painting really unique pictures when used properly. For example, "The curtain of night fell upon us." Doesn't that evoke such a vivid image? It's much more artistic than, "It got dark." She's doing a tightrope walk with her grades this semester. Metonymies are interesting tropes. They substitute one word with a completely different word or phrase. These are common devices in literature and everyday life. A famous example of metonymy is Edward Bulwer Lytton's line "The pen is mightier than the sword." In this example, "pen" stands for "the written word" and "sword" stands for "military aggression." You'll notice metonymy relates to another form of figurative language: synecdoche. An example of synecdoche is "hired hands" to refer to workers. Synecdoche takes a portion of one component and uses it to refer to the whole. He was a man of the cloth (i.e., a priest). You must swear fealty to the crown (i.e., the queen). I can't believe he's returning to the big house (i.e., prison). Personification is another exciting trope. It can dress up writing in unexpected ways. With it, writers give inanimate objects lifelike qualities. For example, "The chair squeaked in pain under his enormous weight." Unless you're living out a scene from Beauty and the Beast, furniture is quite inanimate. While it might not actually "squeak in pain," it might creak or crack if the piece of furniture is straining to uphold a heavy weight. The flowers nodded their heads. The pizza disagreed with me. The old car wheezed and complained. A pun takes two separate (but relatable) ideas and pushes them together to create new meaning. For example, "She had a photographic memory but never developed it." The second half of that phrase strikes up an image of developing pictures. The gist of the sentence is that she doesn't use her memory to the best of her ability, a far less exciting way to express the same thing. I really wanted a camouflage shirt but I couldn't find one. I've been to the dentist a hundred times; I know the drill. A rhetorical question is one that you do not expect anyone to answer. Usually, these questions are posed to drive a point home. They're also used in methods of persuasion. How did he get that job with no qualifications? This trope compares two things, similar to a metaphor, using the words "like" or "as." The goal here, too, is to compare two items and paint an illustrative scene, without coming right out with an obvious statement. That explanation was as clear as mud. Watching that movie was like watching the grass grow. Your house is as clean as a whistle. 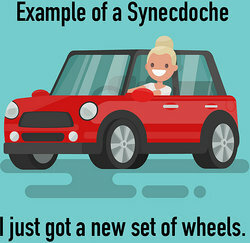 Synecdoche takes a part of a whole and uses it to refer to the whole, similar to metonymy. Although that sounds roundabout, it helps prevent the overuse of certain words. For example, someone might say, "Check out my new wheels," when they're asking you to look at their new car. They're her hired hands (i.e., workers). We need boots on the ground (i.e., soldiers). Instead of cash, I'll just use plastic (i.e., a credit card). Zeugma uses one verb and applies it to two different items. It stretches the meaning of the verb and applies a little levity to the situation while encouraging readers to think more deeply. With these, it's best to tread lightly because the last thing you want to do is confuse your readers. I left my heart and my luggage in San Francisco. He broke my heart and my car. He fished for trout and compliments. Tropes and schemes are figures of speech that add color and interest to language. Each of them contribute to the author's style and convey meaning in a colorful way. Schemes also play around with word placement through punctuation. Changing the placement of a comma can drastically change the meaning of a sentence. What if someone wrote, "Let's go get a little Italian baby." Seems like they want to go adopt a baby from Italy, right? That's quite different from "Let's go get a little Italian, baby." Scents of parmigiana and red sauce should float through the air as, in this sentence, it simply means the couple wants to go to an Italian restaurant for dinner. You can see how tropes can quickly meld from a literary device to a cliché. Try to add these examples of clichés to your memory bank and avoid the temptation to use them in any of your future writings if you want to be fresh, original and expressive. "Examples of Tropes." YourDictionary, n.d. Web. 18 April 2019. <https://examples.yourdictionary.com/examples-of-trope.html>. “Trope” sounds like a highly sophisticated literary device, doesn’t it? Fear not. It’s simply a label for words that say one thing but mean another. In essence, it’s a synonym for “literary device,” because it’s all-encompassing. A trope can be a metaphor, a simile, an example of personification, verbal irony, and more. In more contemporary usage, it can be a synonym for cliché too.Let’s walk through a few examples of tropes; seeing them in action will provide further clarification.